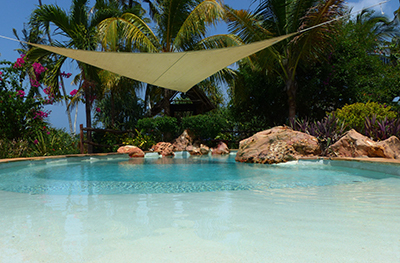 Enjoy the tranquility, the view, the tropical garden, rest and relax at the pool. Hang in the sofa, walk the beach, talk to the fisherman. This weekend was spent in a stunning place. Us people living here we are rather spoiled with awesome places and are always looking for something special. And we found it. Che Che Vule in Matemwe is a private villa that can accommodate up to 11 pax- but it is as nice to be only four. There are countless balconies, jetty, sunbeds, terraces and other cozy places to enjoy the tropical garden and view of the sea just below. Everything is immaculately managed and cleaned. From room to pool to garden to food. Attention to detail- we like it. The staff took well care of us without being annoying in their eagerness to please and we just enjoyed having them around. The chef did an awesome job in the kitchen and we specially enjoyed the octopus salami and the chilled avocado soup. 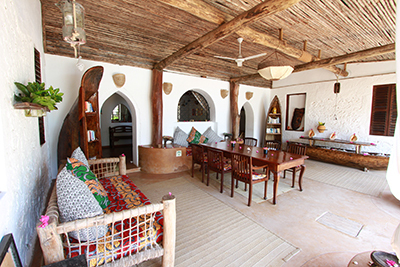 So if you want something different on Zanzibar, away from the tourist crowd, we can highly recommend Che Che Vule . The price starts at 450 usd for 4 pax on half board.